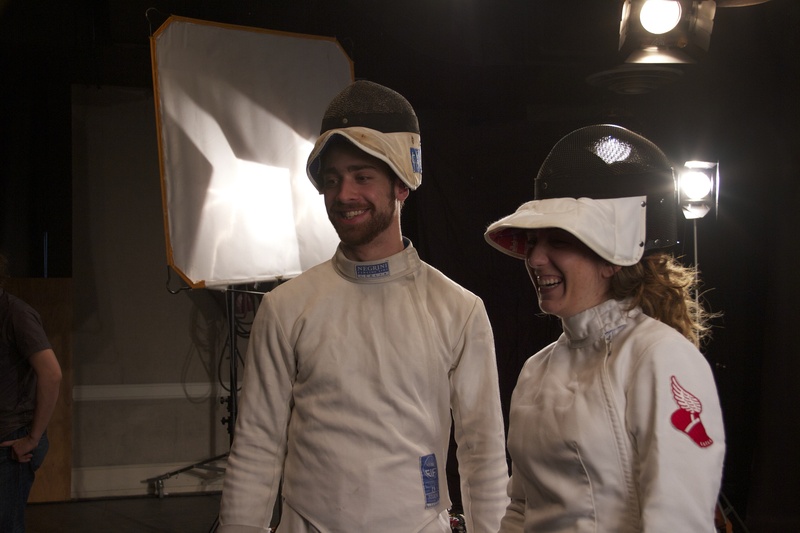 Fencers hanging out between shots. Started fencing in 1998 in Baltimore, MD. Fenced for Columbia University 2005-2009. Represents the New York Athletic Club. Finished 14th at 2009 NCAA Championships, just missing All-American honors … placed seventh in men’s sabre at NCAA Regionals … picked up eight wins at NYU Invitational … winner of the James Murray Memorial Trophy at the 2008 Varsity C Celebration … first team All-Ivy League … qualified for NCAA Championships with seventh-place outing at Regionals … eighth at IFA Championships … 11-4 mark on second day of Ivy League Championships, helping Lions to the title … went 7-2 in tri-meet against NYU, Sacred Heart and Vassar … in 2006-07, enjoyed a solid season … won five of seven in the Ivy League … 3-0 vs. Yale and 2-1 vs. Penn in key Ivy bouts … 14-11 as a first-year, winning two of three vs. Penn State and Duke. Started fencing foil in 1992 and switched to epee in 2010. Fenced for Columbia University 2002-2006. Member of the USA National Team … Cadet World finalist in 2000 in Hungary … bronze medal in Junior Women’s Foil and placed 10th in Division I at the Summer Nationals. 28-9 overall, 9-3 in the Ivy League in 2004-05 … honorable mention All-American for the second straight year after placing 11th at the NCAA Championships … missed the first four matches of the season, but performed so well in the second half of the season she earned second team All-Ivy League honors … 24-3 in last nine matches of the season … seventh at the IFA Championships … earned silver medal at Regionals … as a first-year, posted 42-8 record, 13-2 in the Ivy League … first team All-Ivy League … honorable mention All-American by finishing 10th at the NCAA Championships … won silver medal at North America Cup in juniors division, finished 20th in Division 1 … placed 4th at the IFA Championships … finished 11th at Northeast Regionals … brought a world ranking into her first year of collegiate competition. Started fencing in 1995 in Louisville, KY.
Fenced for New York University 2003-2007. Represents the New York Fencer’s Club. A four-year standout performer for the Violets’ fencing team who compiled a 170-54 epee record from 2003-07, Willock earned Second Team All-America honors by finishing eighth at the 2005 NCAA Fencing Championships. She also won the NCAA Northeast Regional epee title that year, capping a season that saw her win a career-best 54 bouts. In addition, Willock also captured the Intercollegiate Fencing Association epee championship as a freshman in 2004. A 2007 graduate of NYU’s College of Arts and Science with a Bachelor of Arts degree in history, Willock also competed for the 2005 U.S. Senior World Championship squad and the 2007 U.S. World University Games team. She was a 16-time University Athletic Association (UAA) Athlete of the Week, a three-time UAA Winter Sport All-Academic honoree and a recipient of the NYU Student-Athlete Academic Achievement Award in 2007. Willock secured a spot as a member of the United States National Fencing Team that will compete at the 2010 Senior World Championships in Paris, France. Started fencing in 2000 at Oak Knoll School in Summit, NJ. Fenced for the University of Pennsylvania 2003-07. 2002 NJSIAA State Epee Champion … NJIS State Epee Champion … Santelli Team Champions … 2003 NJIS State Epee Champion … NJSIAA Epee Squad Champions … 2004 Honorable mention All-America … First-team All-Ivy … Earned a ninth-place finish at the NCAA Championships … Amassed a 28-10 overall mark and a 7-2 Ivy record … Placed eighth at Temple Open in collegiate debut (11/2) … Finished 12th at Penn State Open on (11/22) … 2004 Junior Pan American Champion … 2005 First-team All-America … Second-team All-Ivy … Academic All-Ivy … Compiled a 47-12 record … Finished fourth at the NCAA Championships … Placed first at the NCAA Regionals … Took the bronze at the IFA’s on Feb. 26 … 2006 First-team All-Ivy … Went 35-10 on the season and 13-5 in Ivy League bouts … Placed 21st at the NCAA Championships (3/17) … Finished fifth at the NCAA Mid-Atlantic/South Regional (3/10) … Earned the gold medal in the individual competition and a fifth-place finish in the A-Division at the IFA Championships (2/26) … 2007 Philadelphia Inquirer Academic All-Area … Went 39-23 overall and 10-8 against Ivy League opponents … 2011 World University Team member. Fascinado por el video “Speed Of Fencing”. Me encanto mucho ya que podemos saborear los movimientos y la plasticidad que solo se muestran en camara Phantom. He compartido con compartido a mis compañeros de armas y ellos me han expresado su fascinación por su película. Al mismo tiempo me ha servido para mostrar a mis amigos o conocidos como vemos y sentimos la esgrima. Como espadista que soy, me enorgullece compartir este material. Estoy seguro que otros videos empleando el mismo concepto pero en armas como florete y sable serían exitosos ya que son armas mas espectaculares como vistosas. Ojala puedan seguir creando vídeos tan hermosos y tan fascinantes.